Through the years, it is common for a room to change. The needs change and so does the social expectations. One room that has changed throughout history is the bedroom. By understanding the role that the bedroom played during the different eras, a person will have a greater respect and perceptive for the antiques and furniture that graced that period. During the early 1800's, the average number of people living within a single home was 10. Since homes were only built with a small number of bedrooms, most family members would have to share a bedroom. According to research, the average number of people to sleep within a single bedroom was 6. Often times, the husband and wife would share a bedroom and then the children (regardless of the number) would share a room. If the family had any live-in help or servants, they would be allowed to have their own bedroom. These rooms were small and only allowed for the necessary items. By the middle of the 1800's, families did not use servants as much, therefore there were more room for family members. With this change also came the modification that siblings of opposite sexes would sleep in a different room girls would have one room, boys would have another. 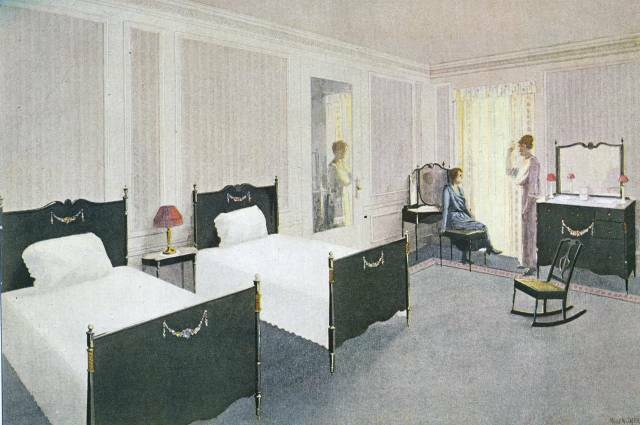 During the Edwardian and Victorian eras, bedrooms were kept to a minimum. Since there was rarely any visitors to the bedroom, the decor was simple. Most bedrooms did have a fireplace that was usually painted white. However, the fireplace was only used if the person that used that bedroom was ill since it was believed that the use of the fireplace would help bring in fresh air and eliminate the germs. One of the main goals within these eras was that all decor for the bedroom must be easy to take care of as well as keep clean. It was believed that a bedroom should promote a general idea of good hygiene, therefore everything was kept simple. Until the middle of the 19th century, bedrooms maintained a rich color on their walls. But by the late 1800's, people began to lighten up the rooms with colors of white, pink, soft greens and even blues. For the upper class families, they often adorned their walls with floral wallpaper. The furniture that graced the bedrooms has changed as well. During the early 19th century, the most common type of bed was made of woods such as mahogany and oak. As the years progressed, the appearance of simple brass and iron beds became a normal fixture in bedrooms. Most beds would have a lot of drapes that surrounded both the headboard and two sides. These drapes would be suspended above the bed on rails and would hang to the floor. Another piece of furniture that was often found in the bedroom was a wardrobe. A wardrobe allowed the occupant to store their clothing. There was usually only one wardrobe found per bedroom since during those times, most people didn't have many clothes. Besides a wardrobe and bed, it was not uncommon to find a chair, chest of drawers and a dressing table. Usually the dressing table would hold a variety of items including combs, perfumes, and candle holders with candles. Also, each room would have a washstand that would hold a pitcher and basin. During the 1800's, the bedroom was used as a place to wash. Servants would fill the wash basin with hot water and bring it into the bedroom for the occupant to use to bathe. The bedroom has progressed through history in a way that has helped shape the way modern bedroom furniture is manufactured. However, the beauty and history of antique bedroom furniture from this era is something that can never be reproduced.